Earlier today, at WWDC '10, Apple introduced the iPhone 4 for the AT&T Wireless network. Apple® today presented the new iPhone® 4 featuring FaceTime, which makes the dream of video calling a reality, and Apple’s stunning new Retina display, the highest resolution display ever built into a phone, resulting in super crisp text, images and video. In addition, iPhone 4 features a 5 megapixel camera with LED flash, HD video recording, Apple’s A4 processor, a 3-axis gyro and up to 40 percent longer talk time—in a beautiful all-new design of glass and stainless steel that is the thinnest smartphone in the world. iPhone 4 comes with iOS 4, the newest version of the world’s most advanced mobile operating system, which includes over 100 new features and 1500 new APIs for developers. iOS 4 features Multitasking, Folders, enhanced Mail, deeper Enterprise support and Apple’s new iAd mobile advertising platform. iPhone 4 will be available in the US, UK, France, Germany and Japan on June 24, starting in the US at just $199 for qualified buyers with a two year contract. Pricing & Availability iPhone 4 comes in either black or white and will be available in the US for a suggested retail price of $199 (US) for the 16GB model and $299 (US) for the 32GB model in both Apple and AT&T’s retail and online stores, Best Buy and Wal-Mart stores. 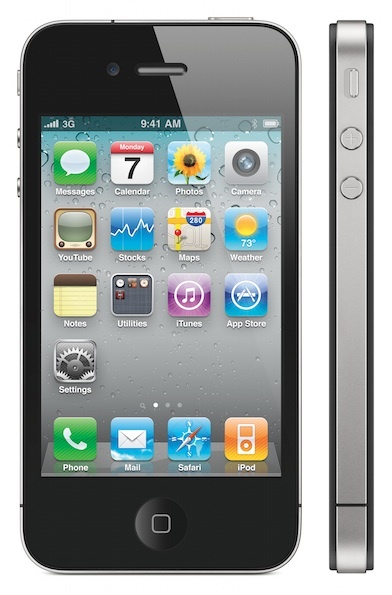 iPhone 4 will be available in the US, France, Germany, Japan and the UK on June 24 and customers can pre-order their iPhone 4 beginning Tuesday, June 15 from the Apple Online Store or reserve an iPhone 4 to pick up at an Apple Retail Store. iMovie for iPhone will be available on the App Store for just $4.99 (US). Also on June 24, a new iPhone 3GS 8GB model will be available for just $99 (US). iOS 4 software will be available on June 21 as a free software update via iTunes® 9.2 or later for iPhone and iPod touch customers. For more details about the new iPhone 4, check out Apple's website. The full version of the iPhone 4 press release is also available online.